The CamelBak H.A.W.G. is a versatile, lightweight tactical pack that provides ample storage space and reliable, easy-to-access hydration. A durable 100-ounce Mil-Spec Antidote reservoir and an additional 1,220 cubic inches of storage give you maximum space with minimal weight. The signature wide-mouth Big Bite Valve and PureFlow tube allow for high-flow water delivery with ease. Side-release shoulder straps provide stability for long periods of walking, running or cycling and the Air Director back panel ensures ventilation in extreme climates. Each part of the pack is padded, including the shoulder harness and reservoir. Adjustable sternum strap and removable waist belt evenly distribute weight, while nylon webbing reinforces the ultra-durable 500 denier ripstop Cordura construction. 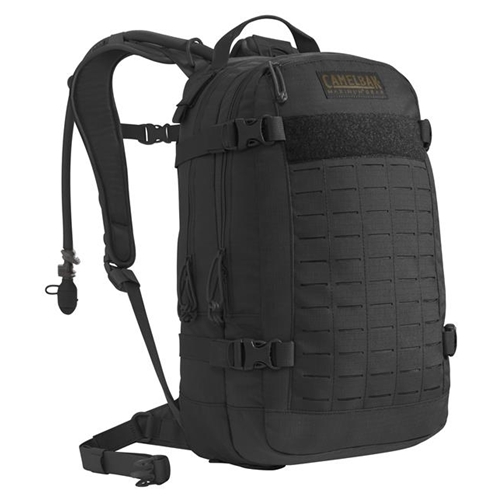 For maximum customization, this pack also features MOLLE webbing along the front for modular attachments. Dedicated compression straps secure gear in place when you are on the move.